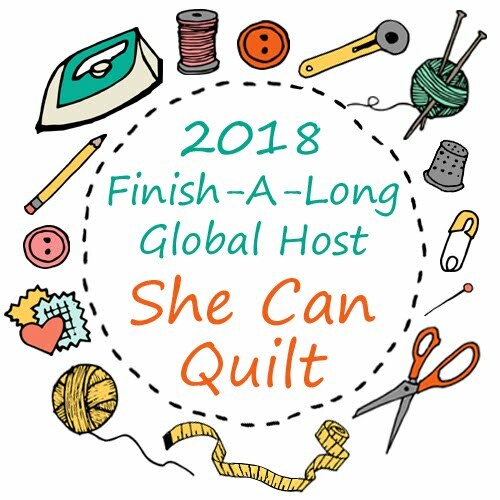 she can quilt: paris - Ta Da! Let me tell you about paris. She is a 24" square mini quilt, inspired by the events in Paris a short while ago. 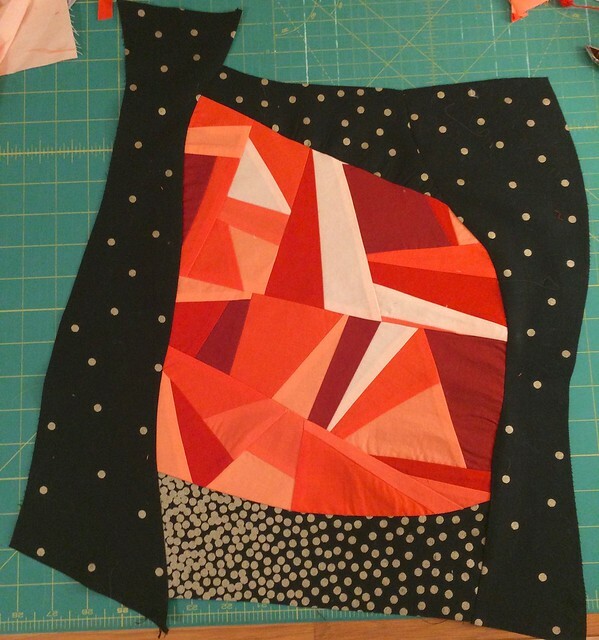 I entered the Modern Quilt Guild Michael Miller Challenge and was sent a number of pieces of the patterned black and white fabrics, which are part of the Glitz line. 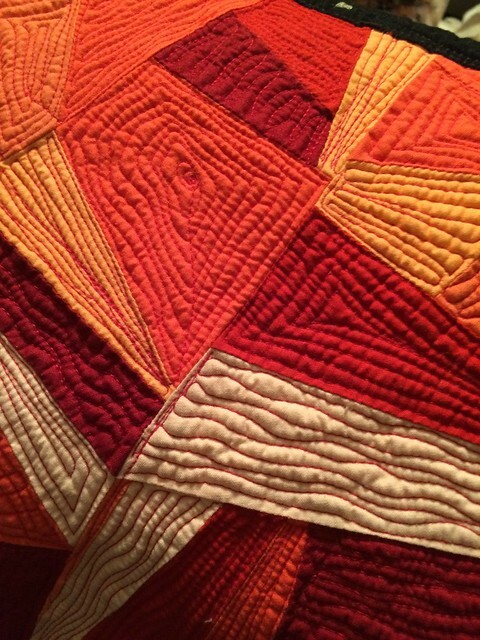 The challenge allowed the quilter to add any other Michael Miller solids. I was stumped creatively with these bold, high contrast metallic prints and let the challenge sit. However, as those who entered the challenge agreed to enter their quilts in the QuiltCon show, as as the entry date approached, I started looking around for some Michael Miller solids in my stash. 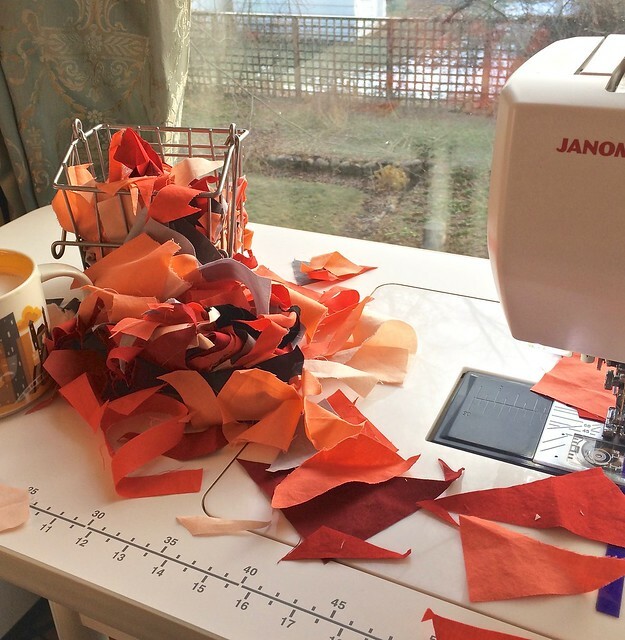 I realized that I had a whole little bin of scraps left over from my ongoing paper piecing project (Violet Craft's Lion). Then the terrorism in Paris happened and I was upset. So I decided to quilt out my sadness. I made the red/orange scraps into a big piece. Continuing along with improv, I improv pieced around the blob, and was surprised to see that it resembled a teardrop - sometimes working without a lot of particular care allows you to create what you need to make. I used up almost every bit of the patterned Michael Miller fabrics piecing around the red tear. Then I quilted it a lot. Given that this quilt is not large, the quilting did not take that long, but it was very satisfying to do. I did wash the quilt to bring out the quilting. This time I washed it before I bound it. first I zig zag stitched around the outside edge. The textures and colours are fantastic - I want to make a lot more pieces with this kind of quilting - sort of controlled scribble. There she again, paris. This quilt is much more about the making for me than the finish - she helped me process my sadness and anger over the events in November. She looks quite dramatic on the wall too. Although I am so tempted to wash her again as that smooth binding bugs me. I have to mention that paris is a " #QuiltConReject ". I entered her at the last possible minute. I got the quilt out of the wash as I was leaving for a business trip. So, I was away from home and had no sewing machine to attach the binding. On the very last entry evening, I hand stitched it on to the front and the back, and then I photographed her and entered with about 1 minute to spare (she was entry #1943). But she is not going to be in the show. I am good with that. The challenge was supposed to feature the challenge fabrics and it is pretty clear that I featured the solids. 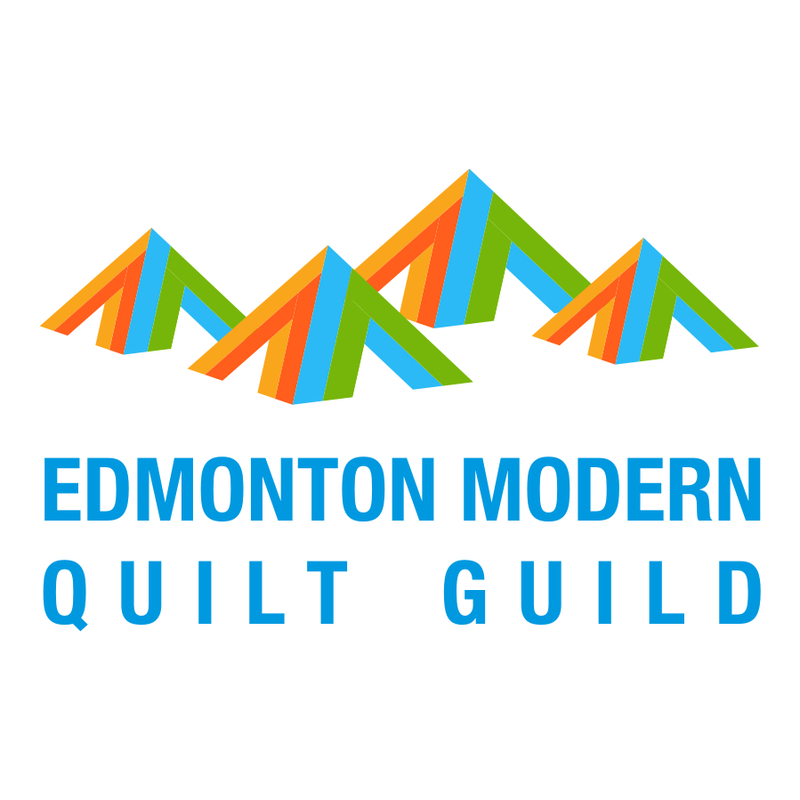 But I have to say thank you to Michael Miller Fabrics and the Modern Quilt Guild. 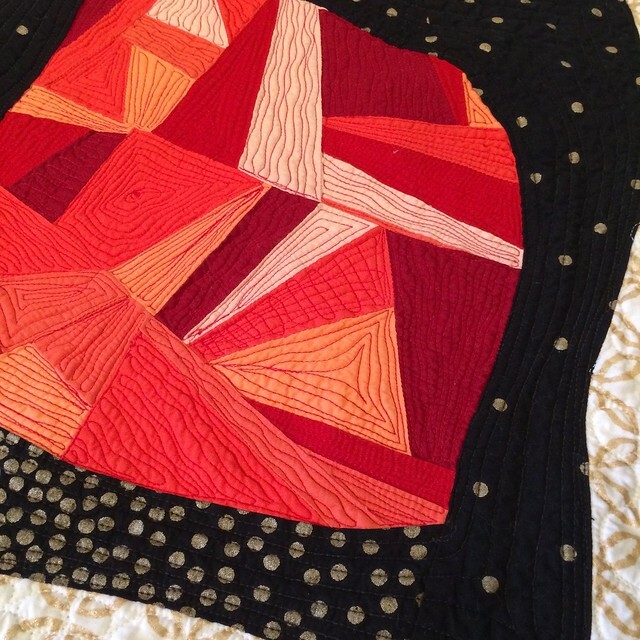 But for this challenge, I would not have made this quilt, and making her was a process that was so good for me. I hope you are enjoying the holiday season. I was able to spend the entire day yesterday tidying my office and sewing spaces. There is so much more to do but I feel better already. Maybe today I can sew a bit. It's quite mesmerising to look at - I think because the shapes and contrast are so perfectly balanced. I keep wanting to come back to it. The oranges and reds look wonderful against the black and white with the gold metallic. For me, it was hard to decide what solids to use with the fabrics. 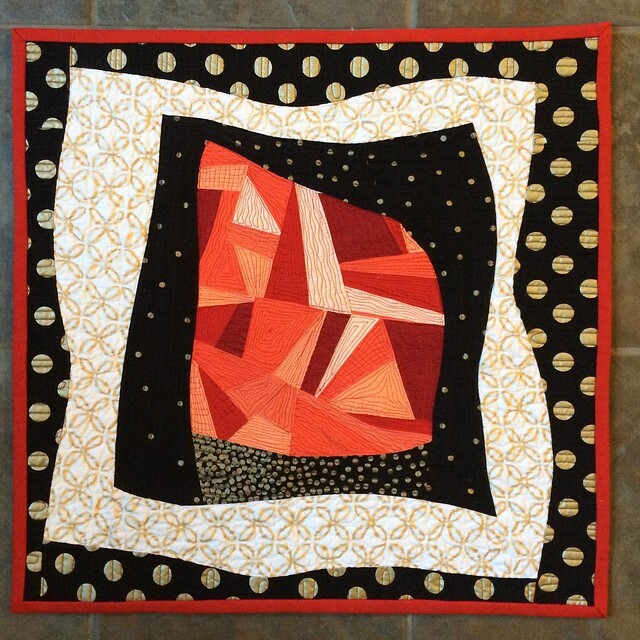 I really love this quilt...especially drawn to the solid improv. Well Done!! Leanne, this quilt is so "you" and so very striking. I especially love your quilting. It's a very beautiful quilt Leanne. This is a striking and beautiful quilt. I'm so glad you explained the process and what it means to you. I saw it as a very happy quilt. I think because the red and oranges are happy colors for me. I totally see how they are also reflective of blood and fire and pain, but that's not my first feeling when I see them. Probably because I've lived a very sheltered life. I love the fabrics, colors, shapes, style and quilting of this piece. I, too, love the story behind this mini quilt Leanne! It is very striking in it's design, and the quilting adds that extra dimension you are so clever in achieving! I think it deserved a place at QuiltCon! 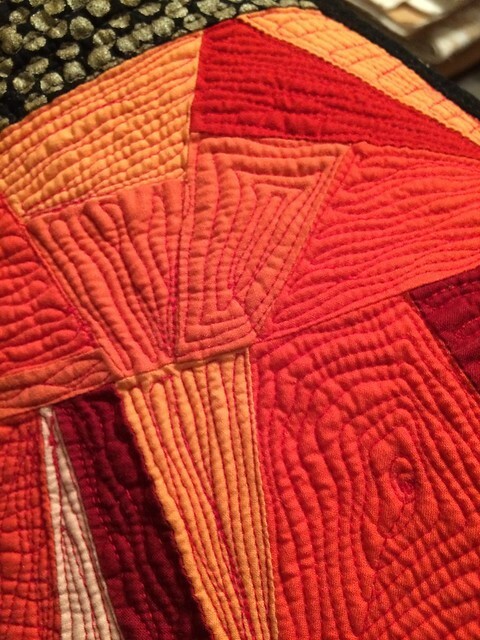 It's always good to hear about another quilter's creative process. Apparently you're motivated by a deadline (heh, heh), and your emotions. That combination makes for a special quilt. I'm glad to know you weren't especially upset by the QuiltCon rejection. Your quilt is lovely! I think the power in watching the quilt come together on Instagram was one of the more powerful parts of this quilt for me, Leanne. The moment you saw the tear shape and posted about it... I, too, am glad that you were able to make it and work through the emotions and share so much with us along the way. I love this quilt, not only for its fine use of fabrics and quilting (It seems the most interesting quilts that I want to see are not the ones I will be seeing), but also as a remembrance of the horrific day in Paris. It really came home to me last month, when I was near the terrorist shooting in San Bernardino and witnessed the helicopters, the police sirens, the chases. I probably need to do a quilt to process it, but the holidays hit and here we are and the sadness still echoes around our community. As always, you are an inspiration. Hope your holidays were family-filled and a good respite from the usual routine. And lastly--I'm happy to bring your buttons to you at QuiltCon, if you need to go that route again. Just email me and let me know. Such a meaningful quilt, Leanne! I'm especially struck by the teardrop shape. Thanks for sharing. 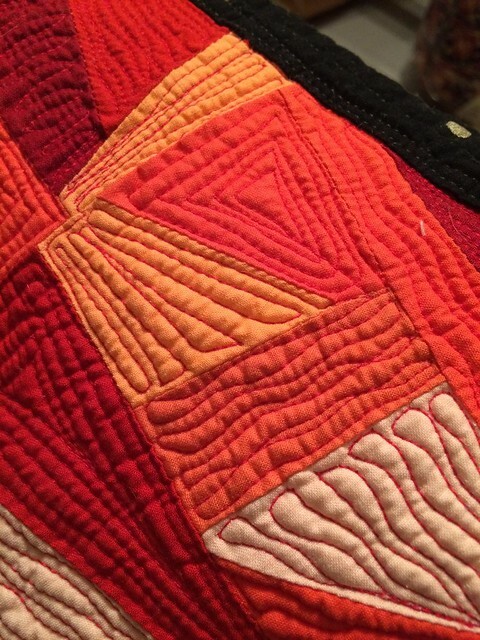 It's the beauty of quilting, and creating in general isn't it, that it helps us to put the world back together and soothes us in times of stress. 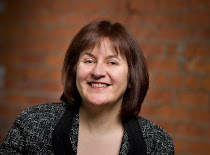 I hear crime writer Val McDiarmuid speak this autumn and she said creativity is the weapon by which we resist those who would seek to oppress us and frighten us and it's wonderfully beautifully true! Lovely quilt and a lovelier process behind it. I love it! Great use of challenge fabrics. The vibrancy of the red and orange against the black is so strong. Either the heartbreak coming out of the darkness, the chaos in the darkness or alternately hope rising out of the chaos and pain , sort of a phoenix from the ashes type thing. In any case, I'm glad it was healing for you, and Quiltcon's loss is your gain. 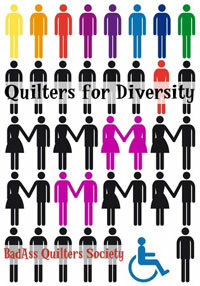 Leanne - It's a stunning quilt and I love even the responses it's evoked from the quilting community. It's really heartening to me to imagine that someone in Alberta Canada could have been so moved by what happened here - it speaks to me of solidarity and unity among us all, even though we don't know each other. I live in Paris and was a few hundred meters from the Bataclan the night of the attacks; a restaurant sheltered us in place until 3 am, when we set out on foot to walk home (my walk took me past three of the sites, and my weekend errands take me by 2 or 3 - I don't live right there in the 11th but nearby in the 12th, and it is definitely part of my world). I especially love Helen Jean's comment above. Thank you for sharing this amazing work and thank you for the care and sympathy it expresses for those families here that have suffered such devastating loss. It's stunning and, as Helen said, it reminds me of a phoenix. The metallic fabrics remind me of the glamour of Paris and I think they're a perfect foil for the central piece. Love this striking quilt. Emotions -even sad ones- often lead to great creativity. Thanks for dedicating this wonderful quilt to Paris. Big news for the 2016 FAL! It's a white Christmas after all, Happy Holidays! Scraptastic Tuesday - December Link is open!